David Cedeño is a 29-year-old father who has been at the "Penetang prison" for 18 months. David suffers from sleep apnea and has requested treatment for this medical reality. While the did buy David a sleep apnea machine, they still refuse to treat him with respect, the staff at the Central North Correctional Centre (CNCC) have been holding David in segregation since September 2012. David Cedeño has been unable to gain a satisfactory response from the CNCC to his situation and is generally fed up with the treatment for all prisoners in jails in Canada. On January 9th, David started a hunger strike which on the day of the interview was on day 17. David was able to use his daily call to get in touch with the grand river media collective and he did a spoken word piece with acapella and an interview detailing his situation. dan also reads David's demands, which are also copied below. 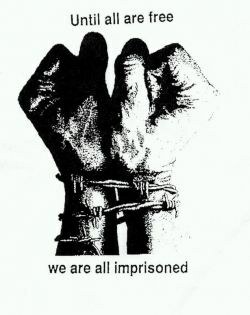 David wants to emphasize that his hunger strike is not just about his personal experience of abuse in jail, but it is for all imprisoned people. demand proper treatment for all prisoners!